A terrifying centuries-old evil has awakened in the form of the wicked, voluptuous Lilith (Isa Anderson, Real Men). Lilith uses her beauty and her insatiable lust as a potent lifeforce which spreads death and destruction to all who dare to succumb to her charms. Posing as a cover girl for a fashion magazine, Lilith becomes the object of insane desire for all who brave her seductive gaze. Only true love can withstand her awesome powers and only one man (Linden Ashby, Mortal Kombat) is strong enough to test them in a frightening test of will and death tango with Night Angel, the mistress of hell. The supporting cast includes Debra Feuer (To Live and Die in L.A.), Helen Martin (TV s 227), Doug Jones (Pan s Labyrinth) and Karen Black (Burnt Offerings). 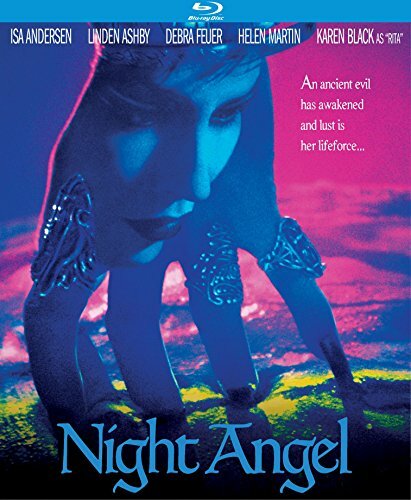 Night Angel was directed Dominique Othenin-Girard (Halloween 5, Omen IV: The Awakening) with a screenplay by Joe Augustyn (Night of the Demons, Night of the Demons 2) and Walter Josten (Pucker Up and Bark Like a Dog).